Talk about cold turkey: Thanksgiving is seeing record low temperatures across southern New England. The National Weather Service says Thursday's big chill made it the coldest Nov. 22 on record in Providence, Rhode Island; Hartford, Connecticut; and Worcester, Massachusetts. 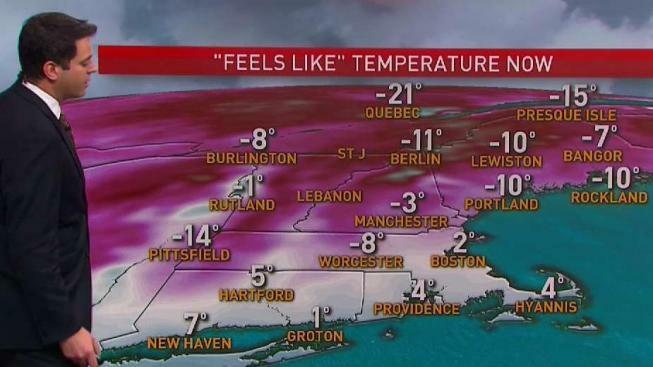 The mercury plunged to 11 degrees in Hartford, breaking the previous record of 14 degrees set in 1969. It also dropped to a frigid 15 degrees in Providence, beating the old mark of 16 degrees set in 1969 and matched in 1987; and Worcester recorded 7 degrees, breaking the previous record of 11. Boston was wicked cold, too, with a low of 14 degrees — but that was well shy of the record 9 degrees set in 1879. The weather service warns that real-feel temperatures are far below those thermometer readings.